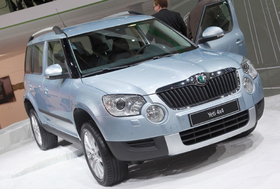 Skoda is hoping the Yeti will boost sales in China, where deliveries rose 56% in the first 11 months. PRAGUE (Bloomberg) -- Skoda will begin manufacturing its Yeti small SUV in parent Volkswagen AG's Shanghai assembly plant at the beginning of 2013, the Czech automaker said today in an e-mailed statement. Last month Skoda CEO Winfried Vahland said in a company union newsletter that the automaker has plans to produce 500,000 cars in China in the future, but it wouldn't give a time frame. Skoda has said it will post record sales this year, fueled by growth in Russia, China and India as well as further expansion in eastern Europe. Sales in the first 11 months rose 12.3 percent to 702,400 vehicles, the company said in an statement on Thursday. That's more than last year's total sales of 700,000 cars. The carmaker expects to sell about 750,000 vehicles this year, according to the statement. Sales in China rose 56 percent in the first 11 months of the year to 167,000 cars.